Brightcove Social allows you to easily publish videos in your Video Cloud account out to YouTube, Facebook and Twitter. Before you can publish videos, you must create publishing destinations for the social accounts you wish to publish videos to. For information on creating publishing destinations, see Creating Social Media Publishing Destinations. In order to distribute videos to a social platform, videos should have at least one MP4 rendition or a video master available. Videos uploaded using one of the Brightcove provided, standard ingest profiles will save a master by default. For more information on archiving masters, see the Archiving Masters document. When distributing videos to a social platform, Brightcove Social will attempt to distribute the highest quality rendition that meets the rules applied by the individual social platform. If the rendition sent to the social platform is rejected, there is no attempt to send another rendition. MP4 assets are better than any other video container. No attempt is made to order the other types of video containers. If the video containers are of equivalent quality, the video with the higher encoding rate is considered better. If the encoding rates are of equivalent quality, the video with the higher resolution is considered better. Note that because not all renditions of a video necessarily have the same aspect ratio, we compare videos based on a computed 'compound' proxy for the resolution by using the product of the height and the width of the respective videos. Note that if one of the video assets is lacking any of the above information necessary to make the comparison, that video is considered 'worse' than the video that has all of the necessary information. Once you have created publishing destinations, follow these steps to publish videos to social media. Click Videos in the left navigation. A list of videos in your Video Cloud account will display. Videos that haven't been published to a social media account will display a Status of Never Published. 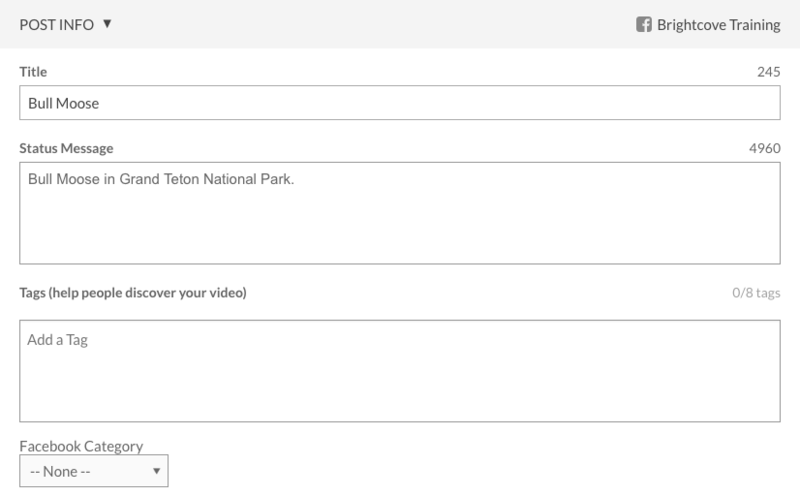 Videos that have been published will display Check Status. Click the link to see the publishing status of the video on the social media destinations. Click on a video to publish and then click Publish. Note: Videos that are DRM enabled will display a lock icon in the video thumbnail. DRM enabled videos that were ingested using a Dynamic Delivery ingest profile can be published, however, they can't be downloaded or have clips created. These buttons will be disabled when a DRM enabled video is selected. Select the destination(s) to publish the video to. You can also click Add New Destination to create a new destination. Note: Destinations with an error will display an error icon ( ) next to the name. Select the destination and then click Reconnect to resolve the issue. Click the Publish to Destination button to publish the videos. Monitor the distribution status by clicking Published in the left navigation. For information on viewing the status of publishing streams, see Viewing Your Social Media Publishing Streams. Publishing videos using the Publish button is a one-time publishing operation. Videos published using this method will not receive any metadata updates from the Social module after the initial upload. By default, videos that are up to 15 minutes long can be uploaded to YouTube. For information on uploading longer videos, see Enabling Longer Videos In YouTube. After a video is published to YouTube, any updates to the source video in Studio will not update on the YouTube side. Note: Default video properties for YouTube can be set by editing the destination. Note: The YouTube API doesn't support disabling comments via their current API so there is no option to disable comments in the Social UI. Checking Use for all destinations will use this thumbnail for all destinations currently being published to. Note: Before you can post custom video thumbnails from Brightcove Social to YouTube, your YouTube account must be verified. For information on verifying your YouTube account, see this link. Note: Updates to thumbnail images in Studio will not update the thumbnail image on the YouTube side. Title - Title of the video (defaults to Video Cloud title). YouTube supports up to 100 characters. Description - Description of the video (defaults to Video Cloud short description). YouTube supports up to 5000 characters. Tags - Tags for the video (defaults to Video Cloud tags). There's no specific tag count limit; you can use max 30 characters per tag, and the text field accepts up to 500 characters. The property value is a list, and commas between items in the list count toward the 500 character limit. If a tag contains a space, the API server handles the tag value as though it were wrapped in quotation marks, and the quotation marks count toward the character limit. So if you have a tag such as late news, this is treated as "late news" and counts as 11 characters (including the quotation marks). 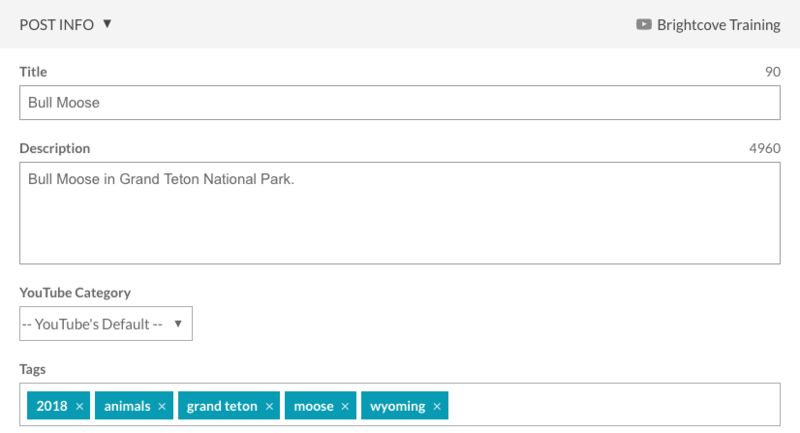 If you exceed the character limit on tags, no error will be reported in the Social module. To verify that videos were shared successfully, click Published in the left navigation, check on YouTube or get the status using the Social API. Schedule Publish Date - To choose a publish date and time for the video. Note: The schedule date and time are sent to YouTube only once, when the video is sent to YouTube. If the schedule date and/or time needs to be changed, they must be changed in YouTube. The Social module will not update any schedule dates or times after the initial sync to YouTube. Use Video Cloud captions - Uses the captions associated with the video. 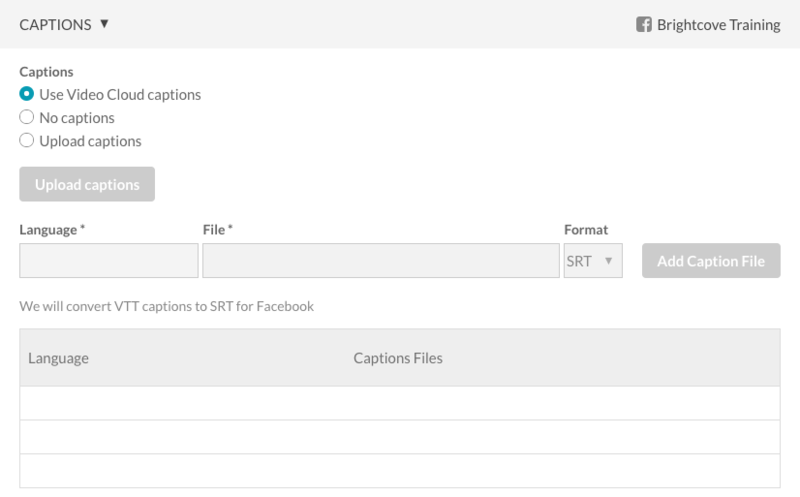 For information on working with captions in Video Cloud, see Overview: Adding Captions to a Video. Upload captions - Click Upload captions and browse and select a captions file. The captions file should be in .VTT or .SRT format. 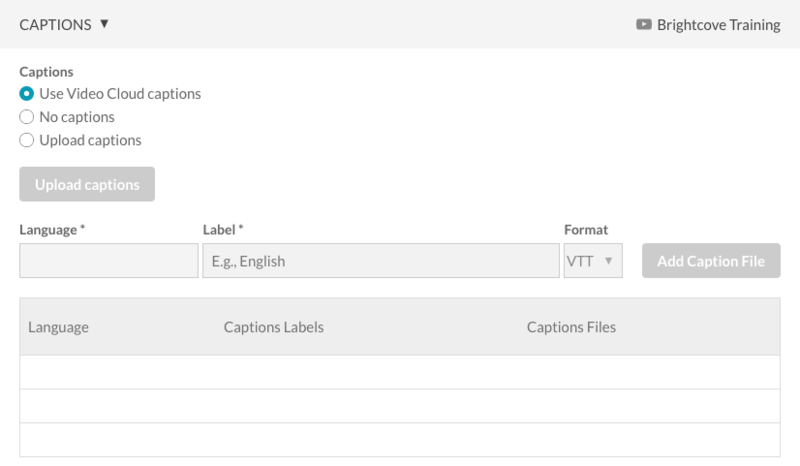 Select the caption Language, add a Label and select the Format. Click Add Caption File. Note: With YouTube destinations, it is possible to dynamically assign the privacy setting using a custom field associated with the video. For information, see Setting the Privacy Status for a Video. After a video is published to Facebook, any updates to the source video in Studio will not update on the Facebook side. Note: Default video properties for Facebook can be set by editing the destination. Note: Facebook does not allow .gif images. If your video is using a .gif for the thumbnail image, the publish to Facebook will fail. Note: Updates to thumbnail images in Studio will not update the thumbnail image on the Facebook side. Status Message - Description of the video (defaults to Video Cloud short description). Note that Facebook has disabled their search API, therefore, it's not possible for us to auto complete a Facebook mention. Tags - Select a Facebook tag from the list. Note that Facebook manages the tags. The Social module must comply with them so Social checks the list when typing into the Tags field. Click on the SCHEDULE link. Select Publish Immediately to publish the video immediately or select Schedule Publish Date and select a Publish Date & Time. 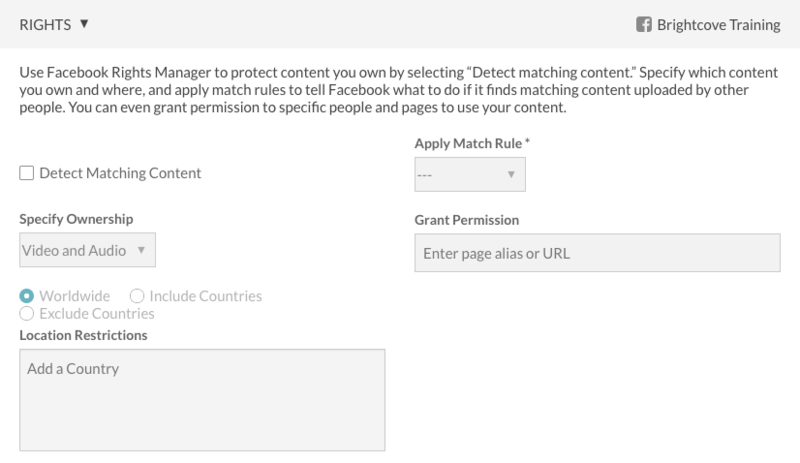 You can also set that Posts Never Expire or select Schedule Expiration and then select a Expiration Date and Time. A Time Zone can also be selected. Note: The schedule date and time are sent to Facebook only once, when the video is sent to Facebook. If the schedule date and/or time needs to be changed, they must be changed in Facebook. The Social module will not update any schedule dates or times after the initial sync to Facebook. For captions Facebook requires a language, which Social populates from the language on the text track, and a name, which Social populates from the label on the text track. Upload captions - Click Upload captions and browse and select a captions file. The captions file should be in .VTT or .SRT format. Select the caption Language and Format. Click Add Caption File. Note: Facebook requires that the caption language include a country in addition to the language. e.g., en-US or en-UK. A language code of just a country code (i.e. 'us') will fail when syncing. Audience Optimization Interests - Add tags to describe the interests of people who are most likely to enjoy your post. For more information, see the Facebook documentation. After a video is published to Twitter, any updates to the source video in Studio will not update on the Twitter side. Note: Default video properties for Twitter can be set by editing the destination. Click on the POST INFO link and enter the Tweet content. Note that @mentions will be converted to #hashtags when being sent to Twitter. For more information, see the blog post, Deprecation of Twitter @mentions in Brightcove Social. Brightcove Social provides the ability to create video clips from existing videos in your Video Cloud account. Clips can be used as short, teaser videos that can be posted to social media. To create a clip, click Create Clip. For information on creating a clip, see Creating a Video Clip Using Brightcove Social. Brightcove Social provides the ability to copy the video URL or download a video source file. When downloading, the highest quality MP4 rendition will be downloaded. If there are no MP4 renditions, the Download link will be disabled. Note: You cannot download videos that have DRM enabled (lock appears in the video thumbnail). If you select a DRM enabled video, the Download button will be disabled. Follow these steps to download a video. Click Videos in the left navigation. 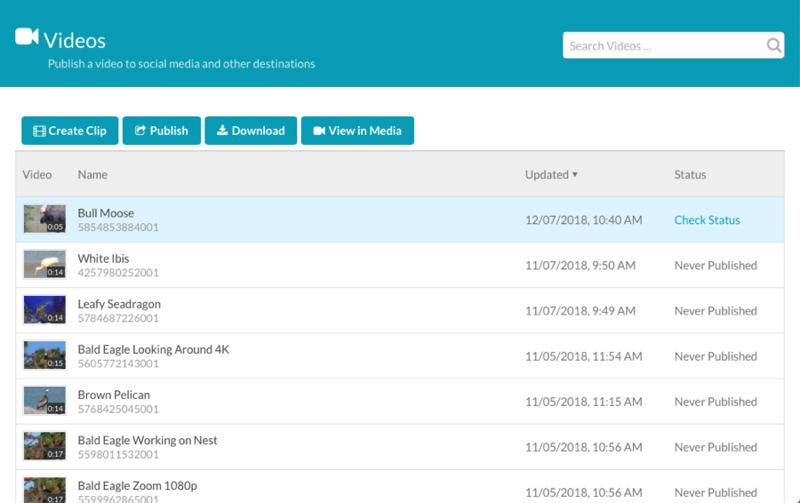 A list of videos in your Video Cloud account will display. Click on the video to download and then click Download. Copy the video URL or click the link to open the video in your browser. Right click the video to save the source file locally. The intention of the download link is to allow you to download the file or to use the URL as a value that can be provided to a social platform’s uploader module (for platforms that support upload from an URL). The URL is not intended to be a long-lived, publicly-accessible URL that you would paste into a public social platform post. Videos on the Videos page can be viewed in the Media module by clicking on a video and then clicking View in Media. Videos that have been attempted to be published to social media will display Check Status in the Status column. Clicking the Check Status link will display a list of social destinations that the video was published to and the status of the publish. Both YouTube, Facebook and the Brightcove Player support 360° video playback. When a 360° video is published to YouTube or Facebook using Brightcove Social, the video will playback in 360° mode. Note that there may be a delay while the 360° effect is processing. Before uploading 360° videos to Video Cloud, there are some things you must do. For information on working with 360° videos, see Working with 360-Degree Videos. Once your video has been uploaded, the process to publish 360° videos is the same as regular videos. Note: Playback of 360° videos is limited to certain browsers. Note: When using the Social module to sync a 360 video, the ingest profile used to ingest the video must be configured to save the master file or the video won't sync in 360.